Capture a beleza de Berlim depois que o sol se põe em uma excursão de fotografia privada de 3 horas. 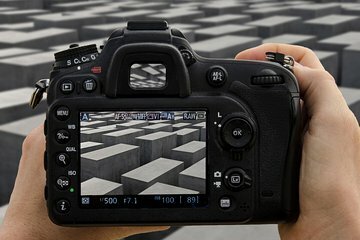 Tire fotos de monumentos famosos como o Muro de Berlim, o Portão de Brandemburgo e o prédio do Reichstag enquanto a cidade começa a ganhar vida. Aprenda técnicas fotográficas noturnas com seu guia e crie memórias bonitas e duradouras com este ensaio fotográfico em Berlim. Definitely a good way to get some good shots when time is a factor! Great tour, got some great photos. Alexia was great. She planned a walk to places in Berlin with great photo opportunities. She reviewed my pictures with a critical eye and recommended different approaches and techniques to use. She is extremely knowledgeable about the features of highly sophisticated equipment and how to take advantage of those features. She left me with good advice for continuing my work with photography. The only thing I would change is that I did not need a review of aperture/shutter speed relationship. This was excellent and learned many new tips to help me take better pictures! Thank you Hannah!